Wow! What a busy week! I’ve been so wrapped up in very exciting secret behind-the-scenes OMGWTFBIBLE things that will make this show even more amazing (and other, more mundane, tasks) that I haven’t found any time to post. That and all the Jewish news this week has been kind of depressing and you can probably read sad things elsewhere. But we have a new Pope! How cute is the new Pope? He’s the cutest possible Pope! 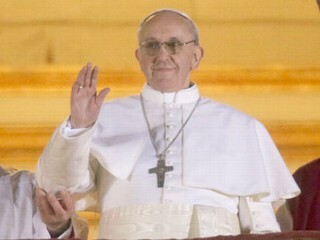 JUST LOOK AT THIS POPE! Anyway, there is a live taping on Monday! Woohoo! If you can make it, I’d love to see you there! Chapter 6 – LIVE! With special guest Steve DeSiena! The live episode will be available online on Saturday, March 23. Everybody wins! Weee! This entry was posted in Episodes, Live Shows and tagged atheism, bible, catholic, comedy, francis, grandpa, jewish, judaism, live, omg, parkside lounge, pope, torah, wtf by omgwtfbible. Bookmark the permalink.